Posted March 19, 2016 by Rodney McAffee & filed under By Rodney, norway, trekkit. This blog post takes place during Norway: The Road Trip, Episode 1 on Bell Aliant TV1. 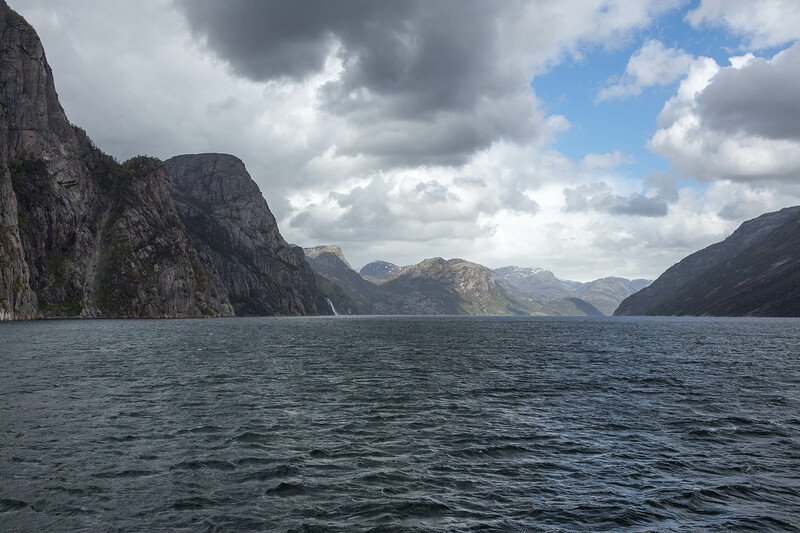 If the purpose of your trip is to see fjords, then you better get on a boat. We booked passage on a small ferry from Lauvvik to Lysebotn. The ferry was so small that we had to back the car onto the boat. We spent 1.5 hours traveling up the Lysefjord, one of the most photographed fjords in Norway. The name means light fjord, and is said to be derived from the lightly coloured granite rocks along its sides. 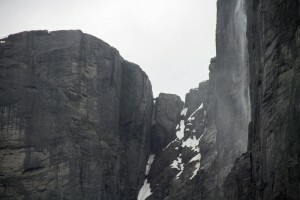 End to end, the fjord measures 42 km in length with bedrock walls falling nearly vertically over 1000 m into the water. The most famous tourist attraction along the Lysefjord is Preikestolen (The Pulpit Rock). It towers an impressive 604 meters over the Lysefjord. This flat mountain plateau, approximately 600 square meters in area, attracts over 200,000 visitors every year. If you look closely in the photo you can see 2 people peering over the edge looking down at us. If the weather cooperates, we will hike to Pulpit Rock and hang over the edge ourselves. Ryan isn’t particularly fond of heights, so stay tuned! 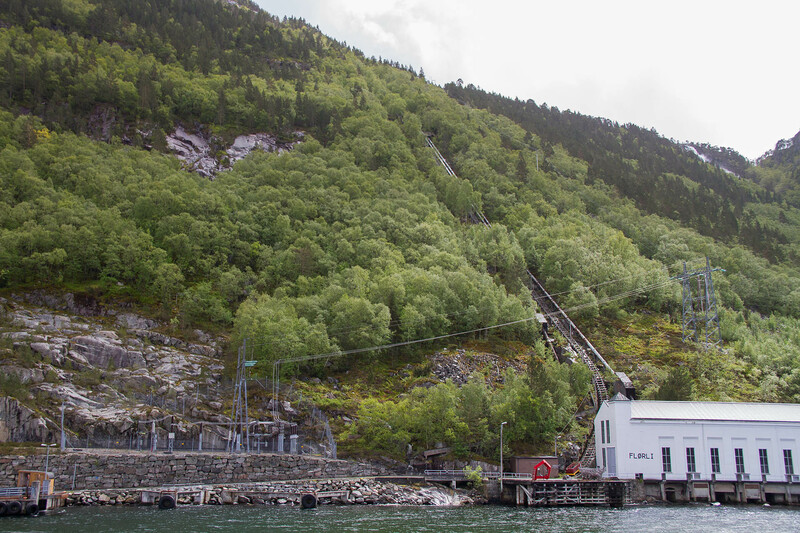 As we travel up the fjord, we encounter a small village with the world’s longest wooden stairway. As there are no roads to the village of Flørli, access is only by boat. The problem is that the village is located at the top of the fjord and residents or visitors must climb the 4444 steps to reach the village. There are tales from a century ago, when children who played outdoors in Flørli were tied like dogs on a rope to the trees in order to keep them from tumbling down into the fjord below. There is also a story about an elderly man who got up from his deathbed and kindly walked himself down the mountainside so that he could pass away in the boat shed, saving his descendants the trouble of having to carry his body down such a steep and precarious slope. 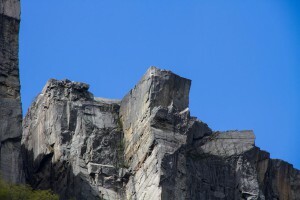 Kjerag Mountain is another popular attraction along the Lyseford. At 1,084 meters above the fjord, it is the highest peak in the area. Our plan was to hike to the Kjerag Plateau. However, the presence of very deep snow along the path meant that the area was still closed. We were surprised that there is still so much snow! It is June after all and it isn’t like we are in the high mountains. Most people make the excursion to be photographed on the Kjeragbolten, a round boulder wedged solidly in a mountain crevice 984 m above the fjord. Kjerag is also a popular attraction for mountain climbers and BASE jumpers. We had no plans to do any BASE jumping on this trip! Waterfalls line the sides of the fjord everywhere. 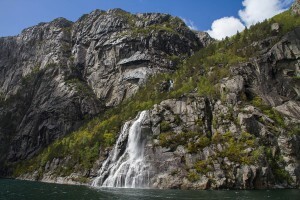 Without being on a boat you would miss these spectacular waterfalls and the steep rock cliffs. Not only is the fjord long and narrow, it is in places as deep as the mountains are high (up to 1000 m water depth). The boat ride up the Lysefjord is definitely one of the highlights from the trip for me. 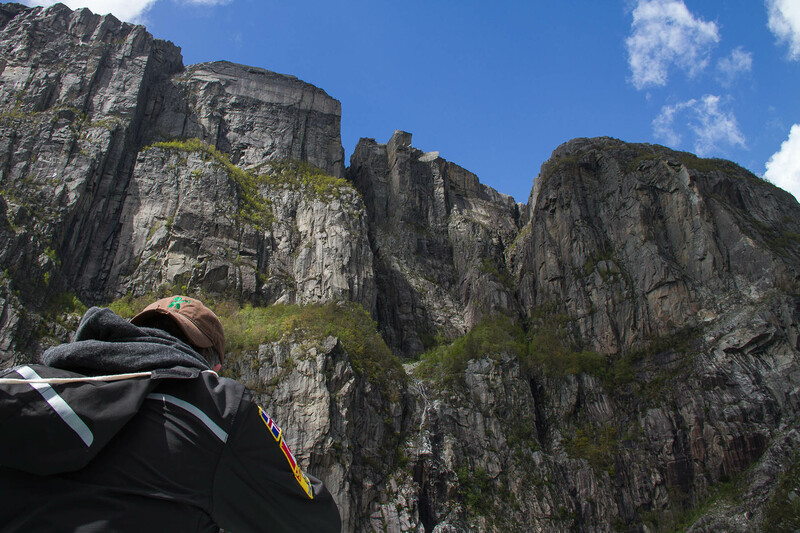 This was a one-way ticket – once we reach Lysebotn, we will get off the ferry and encounter our first mountain road. Stay tuned for my next post when we learn that there may be a problem with the drone.